In common parlance, we hear the phrase “follow the money.” Investigative journalists and social justice advocates focus their reporting on the flow of money, the purchase of luxurious properties and commodities, and other factors which point towards laundering, large amounts of cash, and equally large donations used for influencing corporations and politicians. “Follow the money” makes sense. Today, February 14, 2018, on Valentine’s Day, at least 17 high school students were killed by a former student who was expelled. Them buzz of social media returned to the repetition of such phrase as: “Shocking,” “please pray for the victims and their families,” “Trump needs to do something,” and “how will state and federal legislators deal with this horror.” The usual approach is this too shall pass. For this reflection, I propose that we enhance the dictum of “follow the money” to “follow the bullets.” Bullets are not only tangible metal items, they have symbolic value. Bullets can protect, essentially, they are projectiles designed to disable and destroy a target. When I am asked “what possesses a person to kill others,” my response is the killer’s psychological projections triggered a physical projectile/s: the bullet/s. If we “follow the bullet,” it takes us to defense, or better yet, a psychological defensiveness and the need to buy guns. Yes, the fetish of gun owning is grounded in the belief that guns will protect and even save me. May it be so! But, in the hands of a sick person, the defense if not for safety, but for destroying a monstrous fantasy. Following the bullet takes us to the National Rifle Association (NRA) and its powerful lobby. Can it be that no candidate for public office can win an election without NRA support? In terms of campaign donations, for example, candidate Donald Trump received 30 million dollars from the NRA. Will the president take action against gun violence? What about the NRA’s financial relationship with Russia? We do know that Russia benefits from a divided America and from the terror that mass killings unleash. A few months ago, the Ukrainian Institute of Modern Art in Chicago hosted Daria Marchenko and Daniel Green. 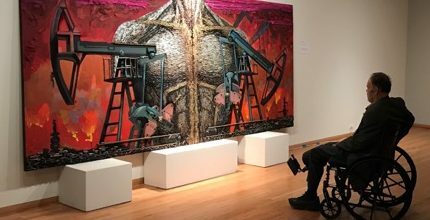 Their exhibit was titled “The Five Elements of War.” The art pieces were created out of bullet shells collected from the fields of the Donbas region of Ukraine. Putin instigated a hybrid war and sent his troops and mercenaries to invade Ukraine and conquer as much territory as possible. The military-industrial complex exists in the shadows of our lives. Distant and near, numbing and traumatizing, people in Eastern Ukraine are killed each day for the sake of Putin’s criminal projections. The same holds true for Syrians, and even for young Russians who are killed.